1. A box of Alphanso mangoes was purchased by a fruit-seller for Rs 300. However, he had to sell them for Rs 255 because they began to get over ripe. What was the loss percentage? 2. Subramaniam bought 100 eggs for Rs.50. Out of these, 4 eggs were found to be broken and he sold the remaining eggs at the rate of Rs 8.50 per dozen. Find his gain or loss per cent. 3. A grocer buys eggs at 10 for Rs 8 and sells at 8 for Rs 10. Find his gain or loss per cent. 4. 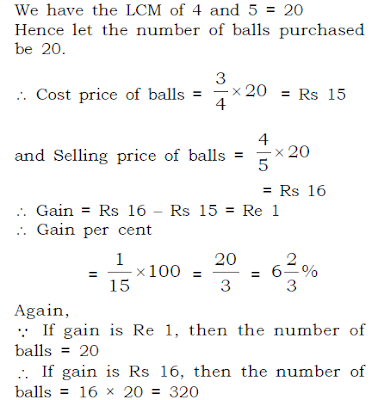 A shopkeeper buys some balls at 4 for Rs 3 and sell at 5 for Rs 4. As such he gains Rs 16. Find the gain percentage. 5. A shopkeeper buys some pens at 3 for Rs 10 and twice the quantity at 4 for Rs 13. If he sells all the pens at the rate of a dozen for Rs 59, then find his gain or loss per cent. 6. The selling price of 10 articles is the same as the cost price of 11 articles, find the gain per cent. 7. Tarun got 30% concession on the labelled price of an article and sold it for Rs. 8750 with 25% profit on the price he bought. What was the labelled price ? 8. If books bought at prices ranging from Rs. 200 to Rs. 350 are sold at prices ranging from Rs. 300 to Rs. 425, what is the greatest possible profit that might be made in selling eight books ? 9. The percentage profit earned by selling an article for Rs. 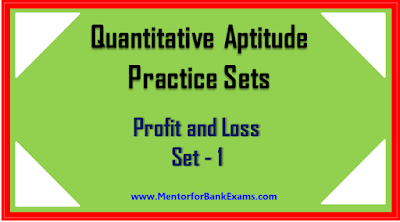 1920 is equal to the percentage loss incurred by selling the same article for Rs. 1280. At what price should the article be sold to make 25% profit? 1. B) We have, CP = Rs 300 and SP = Rs 255. 2. 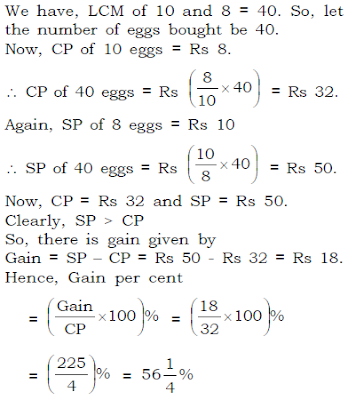 C) We have, CP of 100 eggs = Rs 50. It is given that 4 eggs were found to be broken. So, the number of remaining eggs which were sold in the market = 100 – 4 = 96. It is given that the remaining eggs were sold at the rate of Rs 8.50 per dozen. 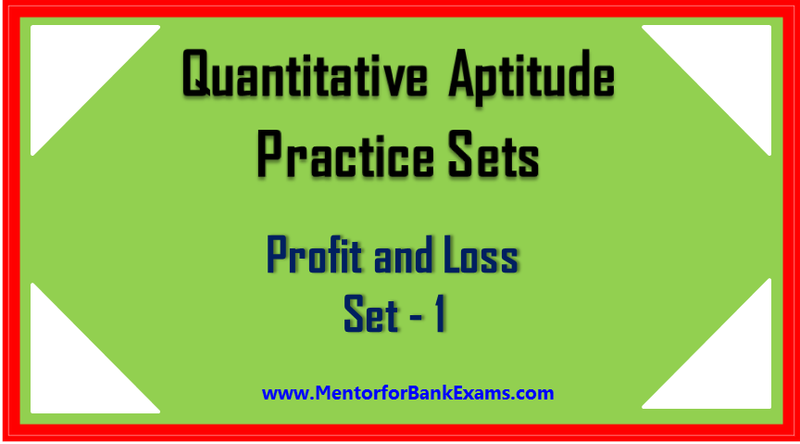 Gain = SP – CP = Rs 68 - Rs 50 = Rs 18. 5. D) Let the shopkeeper buy 1 dozen (12) pens at the first rate. At the second rate shopkeeper buys 2 dozen of pens. 6. D) Let the cost price of each article be Rs x. Let the labelled price be Rs. x. 8. C) Least Cost Price = Rs. (200 * 8) = Rs. 1600. Greatest Selling Price = Rs. (425 * 8) = Rs. 3400. Required profit = Rs. (3400 - 1600) = Rs. 1800. 10. A) C.P. of 56 kg rice = Rs. (26 x 20 + 30 x 36) = Rs. (520 + 1080) = Rs. 1600. S.P. of 56 kg rice = Rs. (56 x 30) = Rs. 1680.